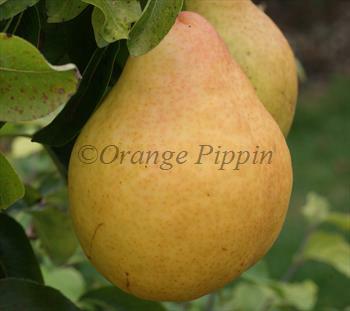 Moonglow is a high-quality early-season pear. The fruits are large with a sweet flavor, reminiscent of Bartlett and Comice from which it is descended. As with most pears, pick slightly early and then ripen indoors. Newly-picked fruits will have some acidity and can be used at this point for cooking. Please fill in the details below and we will let you know when Moonglow pear trees are back in stock. Pick slightly early for cooking with. Moonglow is in flowering group 3. Moonglow is self-sterile and needs to be pollinated by another tree of a different variety nearby. Since it flowers in the middle of the blossom season it can be pollinated by most other pear trees. Moonglow is very resistant to fireblight, one of the most serious diseases of pears. Developed in the 1960s by the US Dept.of Agriculture as part of a program to develop pears which were resistant to fireblight. Moonglow is a cross between an old variety called Roi Charles de Wurtemburg and an experimental variety called Michigan 437 which was derived from Bartlett and Comice. This parentage explains its good flavour characteristics.